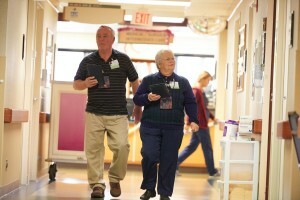 David and Suzanne Martin have shared the work and joy of hospital ministry for the last year. 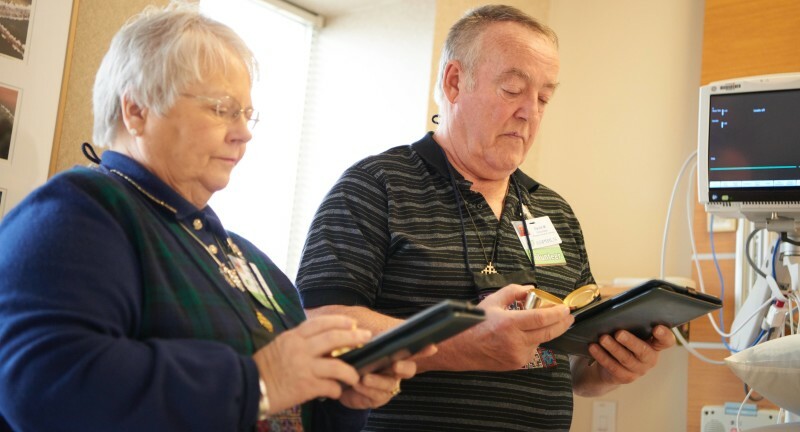 Members of Nativity of the Blessed Virgin Mary Parish in Marathon, the couple visit Catholic patients in Aspirus Hospital in Wausau to share the healing power of Christ through the Eucharist and prayer. For their 51 years of marriage to date, David and Suzanne have made Christ the center of their union, and have shared their faith with others through parish ministry, as well as looking out for others. Faith has always been the heart of their family, which now includes their three children and spouses: Paula and Craig, Beth and Jerry and Andy and Kristine, as well as their seven grandchildren. The Martins were inspired to visit the sick in the hospital after David had a short stay. The gift of Communion while he was a patient in the hospital was precious for both of them. As regular Communion distributors at Nativity of the Blessed Virgin Mary, hospital ministry was a natural transition for the couple. 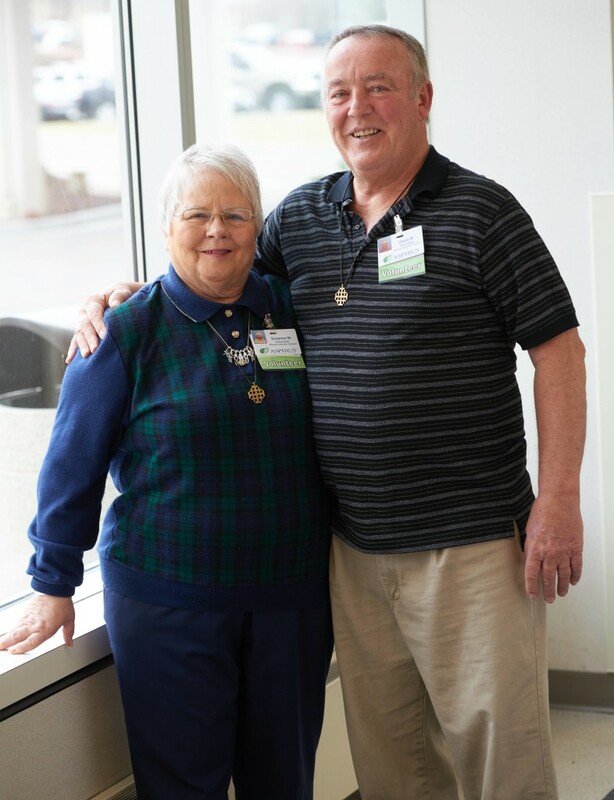 Every other Thursday, David and Suzanne put on their badges that identify them as members of Nativity of the Blessed Virgin Mary Parish and visit patients at Aspirus Hospital. 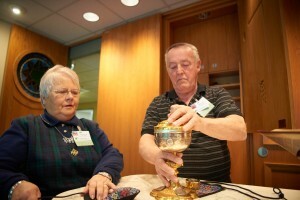 They bring the Eucharist to those who want to receive it, and provide conversation and comfort to other patients. Susan holds the sterling silver rosary given to her 51 years ago by her husband Dave. Both David and Suzanne grew up in the Catholic faith. A serious car accident just before their marriage drew them closer to Christ and to each other. It has also inspired the two of them to witness their faith whenever and wherever God needs them. The witness of Christ through bread has been a part of their lives outside of Mass and the Eucharist. Every year the Sunday before Easter, Suzanne leads “Jesus Day” for the year’s first communicants. She mixes up bread dough made with yeast to share with the children. They discuss how the yeast in the bread is invisible, but it helps the bread to rise. 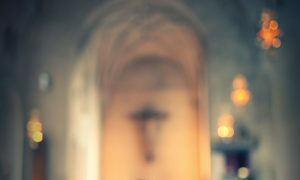 Suzanne explains how Jesus is also invisible in the Eucharist, but when He enters people of faith through Communion, they also rise to be the best person they can be. The students then use the bread dough to make symbols that express their faith and remind them of Jesus. Whether the bread is shaped like a cross, or represents the Trinity though three braids twisted together or three spheres, the children learn the power and the inspiration behind the symbols used in their Catholic faith. Suzanne then bakes the bread, and a special shellac is applied so the symbol can stay as a table centerpiece for their first Communion celebration. the parish. For years, he covered the 4 a.m. shift in the chapel, but a recent back surgery has made it easier to go in the afternoons. Eucharistic adoration was something David discovered in high school. Catholic faith and tradition have been part of Suzanne’s family life since childhood and she loves being able to pass on the traditions to their three children, their spouses and seven grandchildren. She remembers the joy she felt as her maternal grandmother shared special Polish traditions for holidays. One of Suzanne’s favorites was the oplatek at Christmas. The thin wafer made of flour and water resembles a communion wafer and is consumed around the table just before the Christmas Eve supper called Wigilia. Suzanne credits David’s strong faith to the traditions preserved by his mother. 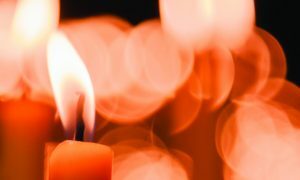 “David’s mother also kept the family together with faith. 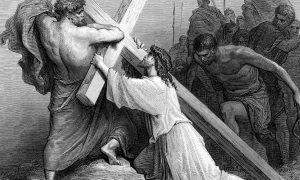 I see that in David’s brothers and sisters,” she says. Even before they found the joy of visiting the sick through hospital ministry, David and Suzanne made sure to bring Communion to friends and neighbors who were unable to come to church. “It’s a healing process,” says Suzanne. Their ministry is a blessing to them and to those they serve, but David and Suzanne don’t believe they are doing anything that isn’t done by many other of Christ’s disciples. “We’re not saints,” David says with a laugh.